Alex Shirley-Smith was a tree house architect. In 2013, fed up with designing custom-made suspended abodes that bordered on the extravagant for his wealthy clientele, he returned to earth and decided to find a new way up. With a friend, Kirk Kirchev, he set to work designing a tent that would perform much the same function as those houses: lifting people above nature and, he thinks, elevating the whole experience of camping. His London-based company, Tentsile, makes strong tree tents that give ecotourists the amusement of sleeping in a tree house without the hassle of permanence or price. Though it’s only two years old, Tentsile is already striking deals with retailers like REI and Backcountry.com, among other global retailers and distributors, who recognize what may be a growing trend. The camping industry is returning to pre-recession levels, and ecotourism vacations are on the rise too. According to a 2012 survey on TripAdvisor, 71% of respondents said they would make environmentally friendly travel decisions within the next 12 months, up six percentage points from the year before. These types of travelers are interested in visiting untouched, natural terrain while giving back to the local community. In the world of camping and outdoor sports, tree tents fill a space that is somewhere between the extreme sport of vertical camping, which is popular with rock climbers, and hammock camping, for solo hikers. Vertical campers use portable hanging tent systems called portaledges, or portable ledges, to suspend a rigid cot from one anchor point when they want to take a nap on the side of a mountain. The Tentsile Connect, pitched above a waterfall. But these tents don’t tend to be portable, and aren’t cheap. An orb-shaped luxury tree tent called the Cocoon Tree goes for around $8,000, weighs 130 pounds, and takes two days to assemble with the help of a trained climber. Another luxury tree tent called the Roomoon starts at $5,800. The product design firm Luminair also makes a nonportable tree house–tent hybrid that a U.K. campsite plans to roll out for visitors to stay in. Another British company called Treepee makes a tent-trampoline combination that has four ground supports and one overhead hanging support. Perhaps the most similar tent to Tentsile’s tents comes from a Vermont-based company called Treez Tree Tents, but it only offers one- and two-person models. Still, the two-person model costs $1,499 and takes weeks to ship. Tentsile, meanwhile, has been able to sell its tree tents for a fraction of the price of its competitors, with models ranging from $500 to $1,500. The Stingray, its flagship tent, can accommodate three people and takes two people about 10 minutes to set up. In a year, the company says, it’s sold over 3,000 of them globally. Along the way, it had to cope with an IP-theft fiasco in China and a remaking of its production process. Five years ago, Shirley-Smith started tinkering around with tree-tent designs in his free time. The first version of his tree-spun tent was a dodecahedron design, similar in shape to its luxury peers. Internally it was known as “Big Mama,” externally as the Giant. It weighed almost 85 pounds and was too difficult to manufacture. 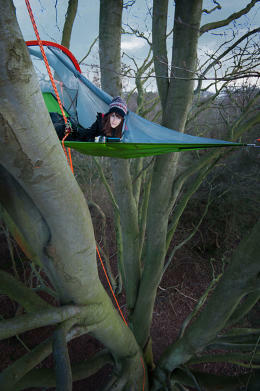 Still, people loved the design in Tentsile’s native U.K. It garnered some initial traction on green design forums. And in 2012, the Giant got a plug on national television. Tentsile’s website got 40,000 hits in 24 hours. Just after Tentsile’s first exposure on TV, he hired Kirchev, a product designer, to help turn the Giant into a manufacturable product. There was just one problem: The Giant couldn’t accommodate the dynamic loads that come with people moving around inside a tent; the structure tended to warp, much like a hammock does when people move around on one. And Shirley-Smith wanted to be able to support eight people at once. The amount of material he would have needed to do that would have made the cost prohibitive. The Tentsile Connect, a modular version of its flagship tent. During a year of product revisions, Kirchev helped Shirley-Smith streamline the Giant to accommodate three people and prep it for manufacturing. The pair focused on the design approach that inspired their company’s name: tensile structures, which are made of lightweight materials held in tension to reduce the need for extra structural supports. The new design incorporated a strong material that has a honeycomb lattice, helping turn their heavy prototype into a more elegant sail of a tent. Called the Stingray, it is now Tentsile’s flagship product, sells for $675, and weighs 20 pounds. To pitch the Stingray and all of Tentsile’s products, you need three trees–or three otherwise stable pillars. The three webbed supports radiating out from the tent are held in tension and at the anchor points with ratchet straps. No matter how insect- or animal-laden, rocky, or wet the ground conditions are, as long as you can find three supports, you can pitch the tent. But if the ground is fine, you’re free to pitch the tent on the ground, too. “Our tents are not only easy to make; they’re fun, they’re enjoyable, and just a little bit enticing,” says Robert Shirley-Smith, Alex’s brother, who joined the Tentsile team just after the Stingray went to production. By 2013, Tentsile started to sell so many tents that Alex and Kirchev could quit their day jobs; soon they decided to move their production to China. Tentsile’s own factory in Ningbo, China. Soon after, the Chinese government shut Tentsile’s new factory down. It turned out that the old factory’s directors accused Tentsile of stealing designs from them. During a one-month legal battle in the Chinese court system, 231 customers waited on their shipments, but Tentsile eventually won and resumed operations. “With us not being there, we didn’t have our eyes and ears on what was happening,” says Robert. Now, the Shirley-Smith brothers direct Tentsile’s daily operations in London, while Kirchev runs Tentsile’s Ningbo factory. The factory’s staff of 17 produce 700 to 800 tents per month; production is smoother and faster, and costs are down. “Kirk moving to China has really brought down the cost of production,” says Robert. With no middleman to pay, Tentsile could reduce its end price by more than 50%. The retail price of the Stingray dropped from $1,499 to $675. In the process, Tentsile became the central player in the growing market of elevated tents. And last year, it began making a new range of tents designed to connect with the Stingray and each other. The Connect is a smaller and modular version of the Stingray that can link up with other Tentsile tents in a series to form a web of tents. (In January of this year, Tentsile created one such network at the Sequoia National Park.) Another model, the Vista, features a detachable roof. Add a few of Tentsile’s new Trillium hammocks, and you can assemble a nine-person tree-tent bunk bed. 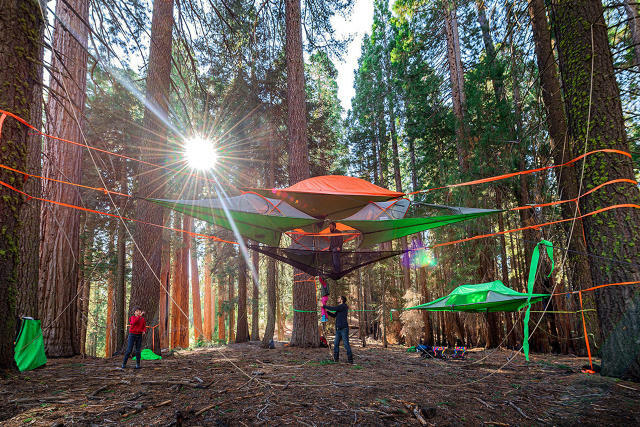 There’s also the colossus of tree tents: the Trilogy Super-Tent, which consists of three modular Connect tents, conjoined with a canopy. The team built a Tentsile Village at Sequoia National Park in January. Another big break came nine months ago, when the camping supply giant REI started selling Tentsile’s tents on its website. It was the company’s first retailer, and its first introduction to the U.S. market. According to the most recent American Camper Report by The Outdoor Foundation and outdoor giant Coleman, 40 million Americans went camping in 2013, or 14 percent of the population, a number that has remained mostly steady in recent years. The global market for camping equipment is predicted to reach $5 billion by 2019, reports Lucintel, a consumer research firm, as consumers replace older equipment for ones with new tech and materials and spend more on recreation. A retiring population seeking outdoor recreation is another source of growth, the report said. While most of Tentsile’s sales have come from its website up until now, the company foresees more activity this year through its new deals with retailers, like REI and Backcountry.com in the U.S. and Bergfreunde.de in Germany. The team also has a distribution deal with the travel site GlobeTrotter.com. Nice not waking up in a puddle of water after heavy rains. Recommend setting up off the beaten path as you will be bothered by people asking you question[s]. I set it up on an island on [a] canoe trip and still had boaters stop and comment on it. For a group of nature lovers, the Tentsile team is extremely wired into the tech world. The site is powered by Shopify. It accepts Stripe. They duly update the Facebook page, Instagram feed, YouTube channel, and blog. And they ship globally with ease, through a company called Shipwise, which lets Tentsile ship anywhere from five shipping depots around the world. “We literally just click a few buttons, and it’s done,” Robert says. In addition to a good logistics partner, Tentsile works with distributors who believe in the brand. Tentsile’s South Korean distributor prominently features Tentsile’s background story on her site’s welcome page. “People in South Korea want to hear those stories, too,” Robert says. Tentsile’s eco-village in the outskirts of Fiji. Tentsile isn’t only interested in revenue; it’s using its business to protect the trees its customers rely on. The team has partnered with WeForest.org to help prevent forests from unnecessary destruction. For every tent Tentsile sells, WeForest.org plants three trees in tropical forests. The company’s conservationist ethos has helped it burnish its ecotourism credentials. At the end of 2013, Tentsile paired up with an NGO to create a self-contained ecovillage in Fiji using its tree tents. Tourists looking for an alternative to the island’s resort life could stay in the tents, situated in the rain forest and supplied by the ecovillage’s own organic garden. Tentsile also offers camping packages in Cambodia and Finland, complete with guides and chefs. (The three-day expedition in Finland costs €855 [$970] per person.) It also sees markets beyond tourism and camping. Expeditions, wildlife filming, scientific research, festivals, safaris, and humanitarian relief situations are all ideal venues for Tentsile’s tents, according to the company’s site. Ryan Robinson, doing a high lining attempt. Still, tree tents face a long climb up the camping equipment ladder. Dan Zenkel, a summer camp consultant, says he isn’t sure that tree tents have found a following in the camping world just yet. But he knows that traditional tree houses appeal to kids at summer camps. And this is a compelling market for the camping industry: as the authors of the American Camper Report note, most American campers begin camping at age 15 and younger. “A lot of summer camps are offering tree houses to kids to sleep in. There’s an opportunity there for these tents,” says Zenkel. They offer a fun element that regular tents don’t, and “they’re cheaper”—at least cheaper than building a tree house.